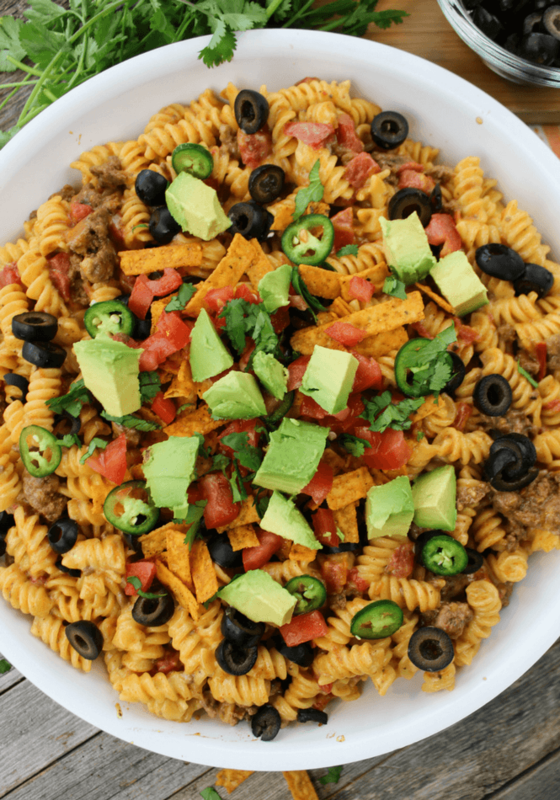 Cheesy Taco Pasta is a quick weeknight meal for the family made with Ricos Gourmet Nacho Cheddar Cheese Sauce, spiral pasta, ground beef, taco seasoning and topped with olives, avocado, tortilla strips, serrano pepper and fresh tomato. I love meals that can be on the table in less than 20 minutes. As a busy mom raising two young children, I just need recipes that are really quick with simple ingredients and easy instructions. This recipe was just something I threw together on a whim and it just works. You are going to want to add this recipe to the dinner lineup this week because it has become one of our go-to dinners and I think your family will enjoy it as well! 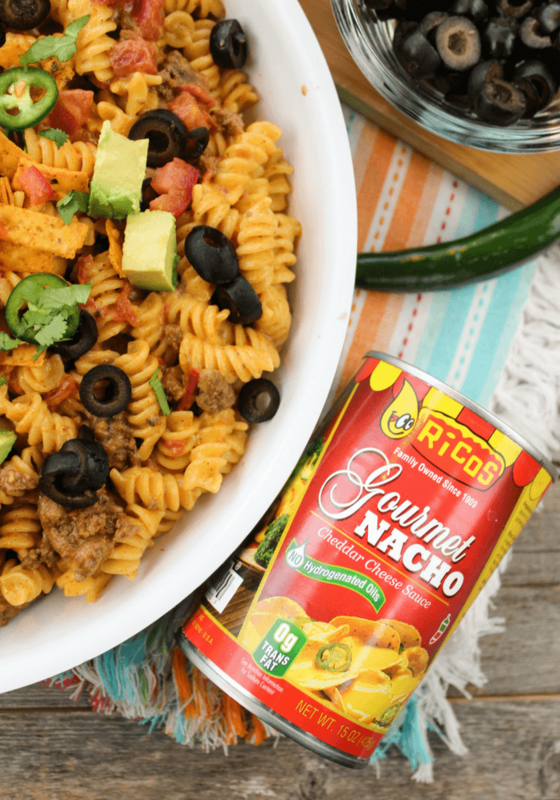 Ricos Cheese Sauce is an important ingredient in this Cheesy Taco Pasta because let’s face it- cheese is life! Ricos is trans Fat FREE and made with no hydrogenated oils. Plus, preparation is a cinch with heat and serve instructions. Find Ricos Cheese Sauces at participating Walmart stores near you. 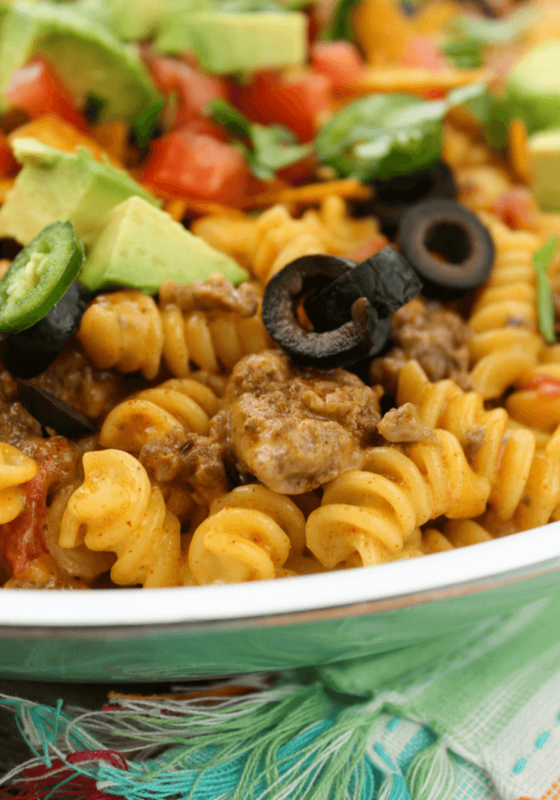 Cheesy Taco Pasta is an absolutely delicious switch up from your regular taco night. Start by boiling a pot of water for your pasta and cook according to package directions. 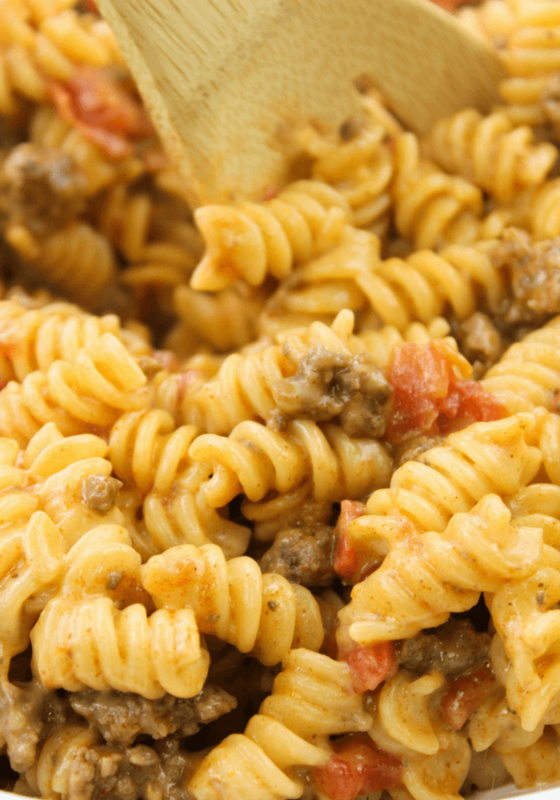 As the pasta is cooking, brown some ground beef in a separate pan with some taco seasoning and add in some drained petite tomatoes. We are seriously almost done with this dish- I told you it was easy! Place the cooked meat on a plate to the side for a moment. Put the pan back onto the stovetop and warm up the Ricos Gourmet Nacho Cheddar Cheese Sauce with a bit of milk stirring often. Time to toss the meat back in with the cheese and add the drained pasta. Stir ingredients together and add all the toppings! As dinner cooks, prep the toppings. We used tortilla chips, black olives, sliced serrano pepper, fresh diced tomato, chopped cilantro and an avocado. Dinner is on the table! other optional topping ideas include: shredded lettuce, salsa, sour cream, guacamole, hot sauce, sliced jalapeno, diced onion, and black beans. Cook pasta according to box directions in a medium pot and drain. As the pasta cooks, brown ground beef in a large saute pan on a medium-high heat. Add the taco seasoning and finish cooking ground beef according to packaged seasoning directions. Add in the drained canned tomatoes and stir until begins to simmer. Move the meat to a plate. Return saute pan to stove, turn down the heat slightly, and add your Ricos Gourmet Nacho Cheddar Cheese Sauce and half cup of milk. Stir frequently to avoid cheese burning or sticking until sauce is creamy. Remove from heat. Add the meat back into pan and add the cooked pasta. Stir all ingredients together. Add your favorite taco toppings. We used a diced avocado, tortilla strips, black olives, serrano pepper, a fresh diced tomato and some freshly chopped cilantro. Chili cheese dogs with Ricos Premium Cheddar for game day. Bean dip with warm refried beans on the bottom and topped with Ricos Queso Blanco. 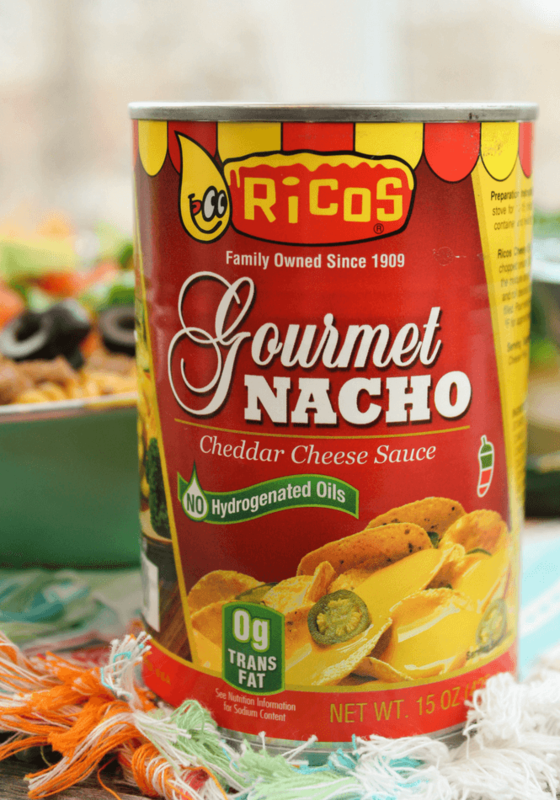 Feed a crowd with Ricos Condensed Cheddar Cheese which has 50% more product once mixed correctly for a nacho bar that is perfect for parties or concession stands. 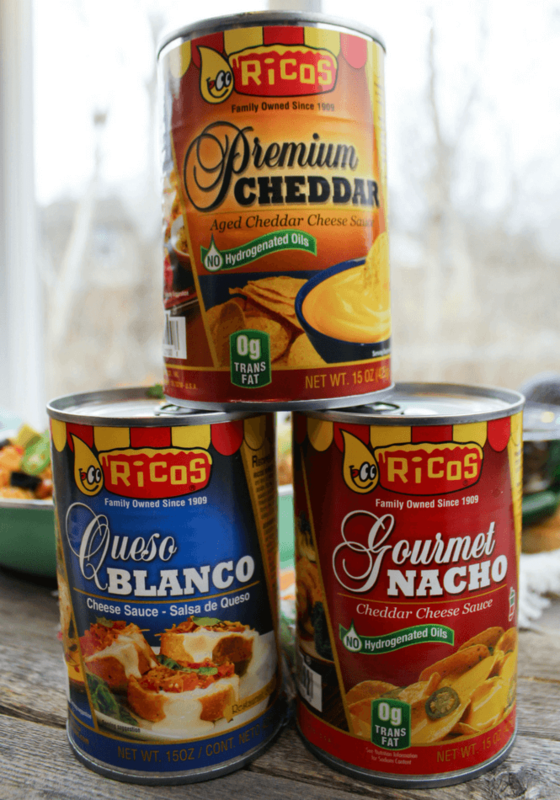 What are your personal favorite recipes or ideas for using Ricos Cheese Sauces? Let me know in the comments below! I’ve never heard of taco pasta! This looks so tasty! Thanks for sharing the recipe. Tacos are on our menu every week because I love them so much, but my family could probably use a new take on them. We have tacos at least once a week too and it is nice to switch it up every once and do a spin on tacos. This looks so good and simple to make. Anything with avocado is a win for me. 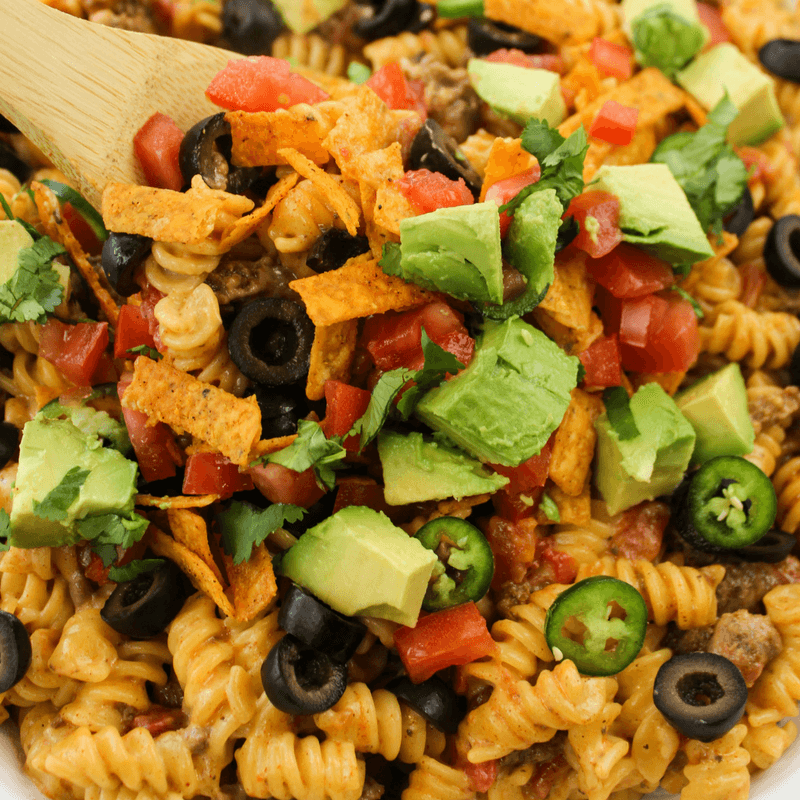 Taco pasta is so yummy…but I’ve never had a a version this cheesy before. Can’t wait to give it a try! The nacho cheese is such a great addition! What a creative recipe! 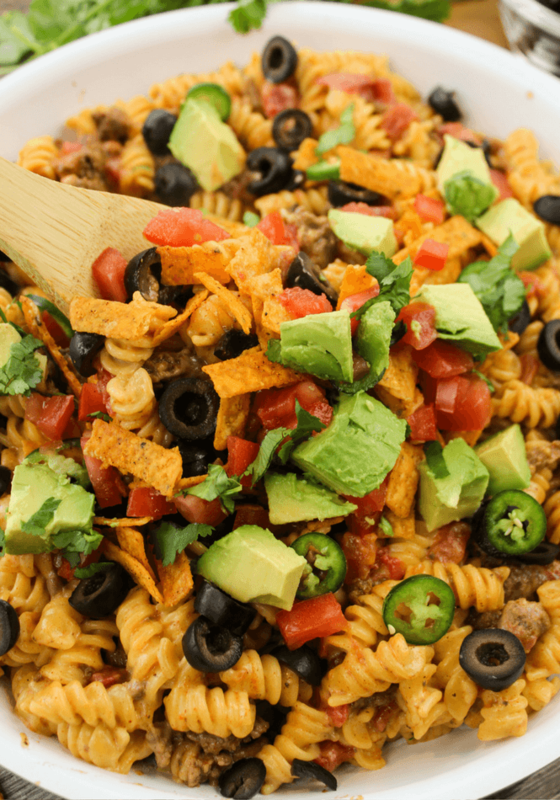 My family love Mexican food and pasta, so I know this will be a hit! Thanks for sharing! Can’t go wrong with either for a family meal and combining the 2 really works out in this dish. This looks seriously delicious!!! Me and my hubby would devour the entire thing! Brilliant! Tacos and pasta are two of my favorite things. Love the idea of combining them into one meal! My favorites too and they are really tasty as one.